I own two of the healthiest, fattest calves in America. See how I keep them growing! Every time I walk into the gym, someone sidles over and asks how me how I've developed such massive calves. They're a conversation starter, an icebreaker, and over time they've become my calling card. Only I'm not at the gym to introduce myself or receive guests. I'm there to train. Granted, I've got great genetics in my lower legs. But my workouts have a lot to do with it as well. Through trial and error, I've come up with workouts that force my calves to grow like crazy. They simply have no choice in the matter. I recommend training calves 4 or 5 times per week. Just tack it on to the end of your regular workout. It shouldn't take more than 10 to 15 minutes to blast them. For the first three exercises, you're going to switch your foot placement (toes forward, outward, inward) every 10 reps to make sure you hit your calves from all angles. For the fourth exercise, standing calf raises , we'll keep it simple and stick with the toes-forward angle. That's because balance is really important. I like to do my standing calf raises on a platform with dumbbells, because the machine puts too much pressure on my shoulders and back. If you don't have a partner for donkey calf raises, use a machine. On every rep, go all the way down and get a good calf stretch. Get a good squeeze and contraction at the top of every rep.
Over time, strive to increase your poundage on all of these exercises. 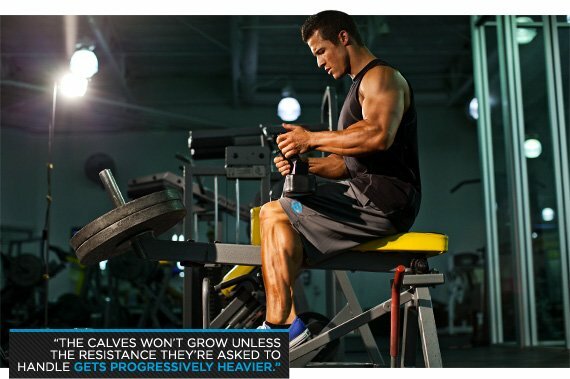 Like any muscles, the calves won't grow unless the resistance they're asked to handle gets progressively heavier. In between each set, stretch your calves so they don't cramp up in the middle of the set. Don't lock out your knees; keep them slightly bent for every rep. Note: As your calves grow stronger, increase the number of sets from 2 to 3, and then to 4.